There is nothing like One Design Racing !!! The forecast wind was W/SW 14 to 24knots and nobody could dispute that it was incorrect. 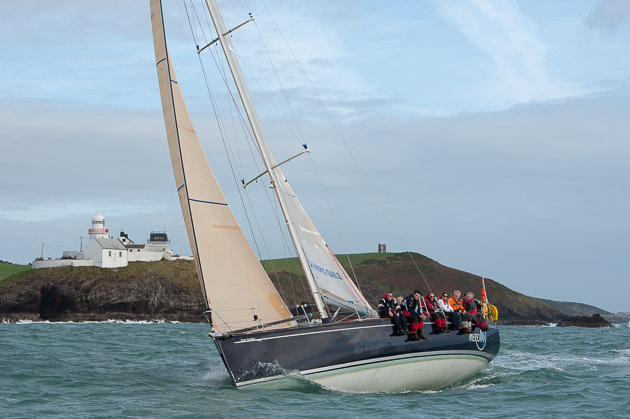 Whitesail 1 and 2 and Class 4 were with RO David O’Brien and team who set up a line down off Whitegate and sent off Class 4 first, having waited while the Brittany Ferries Bretagne passed inward bound on her way to Ringaskiddy. 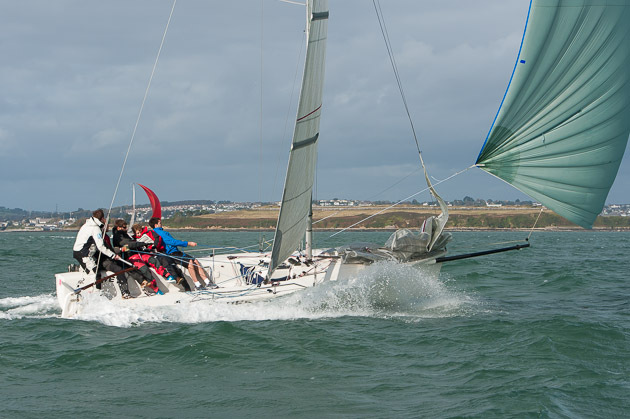 The Class were a little bit unfortunate that an anchored vessel decided to up anchor and do a 360 degree turn leaving the fleet to get out of her way which they did with alacrity. Simultaneously WS2 were also starting and they also had to get out of the ship’s way. WS 1 then went for their start. 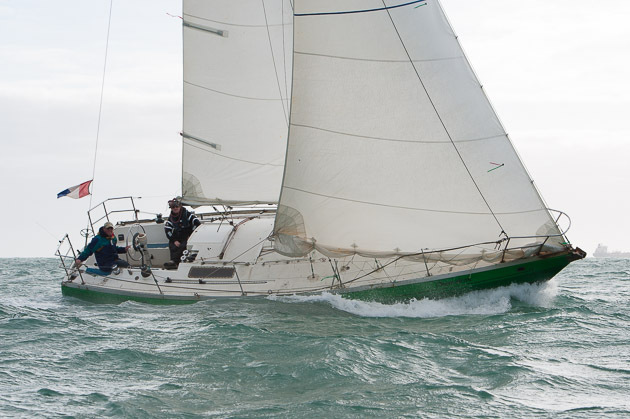 Indulgence went for a pin end start but wasn’t quite fast enough and got caught on starboard by the wily Michael Wallace sailing Felix. The first mark was No. 10 and Yoshi made a mistake and overstood the mark by a good distance and had to return. Your scribe’s researcher then went out to watch the 1720s sailing. 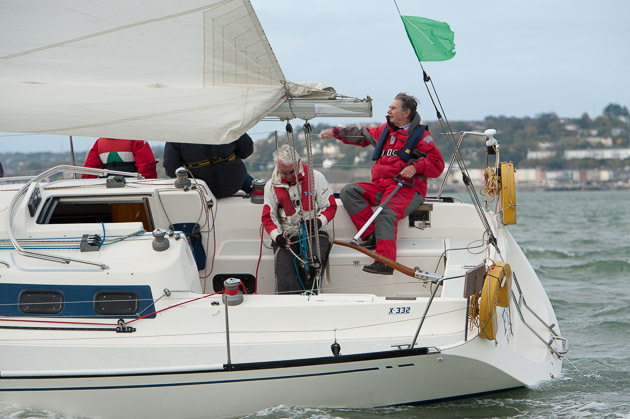 They were doing windward/leeward courses across the harbour at great speed so much so that the third race had a yellow flag flown to indicate they would use smaller JIbs and small spinnakers. Meanwhile Classes 1, 2 and 3 sailed outside the harbour. 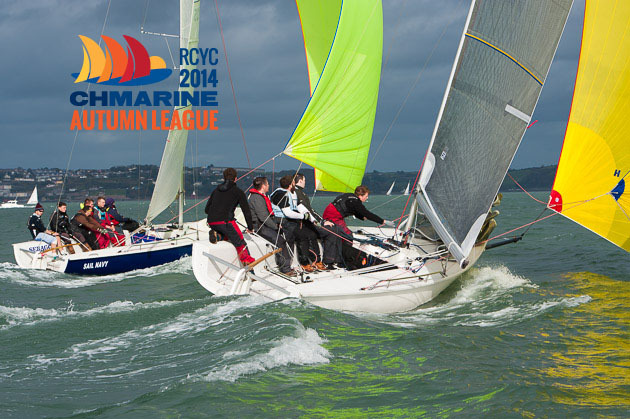 The first race was a windward/leeward course. 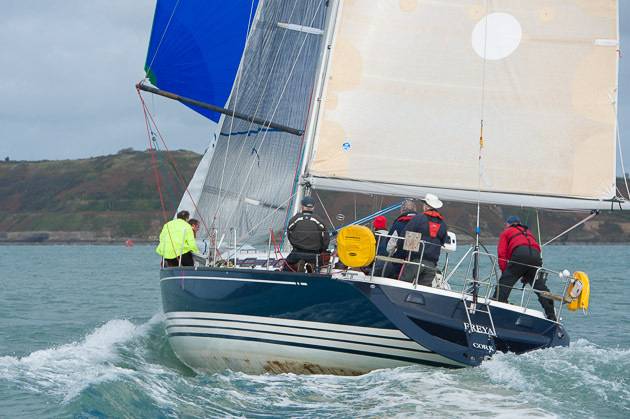 The second race was windward/leeward with a two sail reach into Western mark and then into the harbour where Sparetime was anchored off the Cage to finish the fleet. 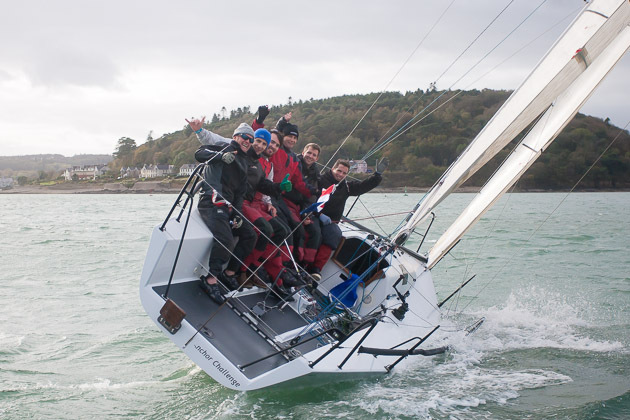 All in all a splendid day of racing that left the sailors exhausted but exhilarated and in fine fettle coming ashore. 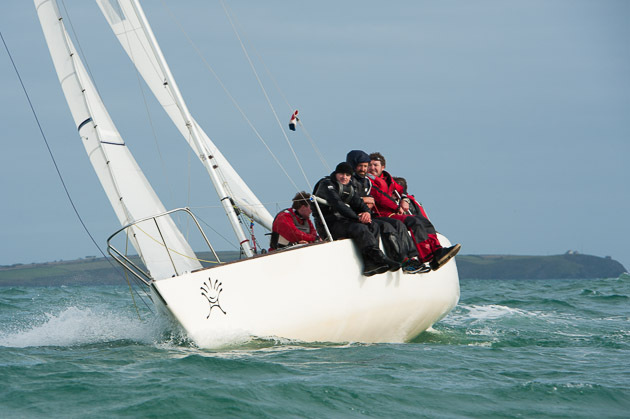 Following the exhilarating racing of the final day the competitors were in top form and after the presentation of the day prizes were looking forward to the prize giving dinner which proved to be a sell out event and was thoroughly enjoyed by all. 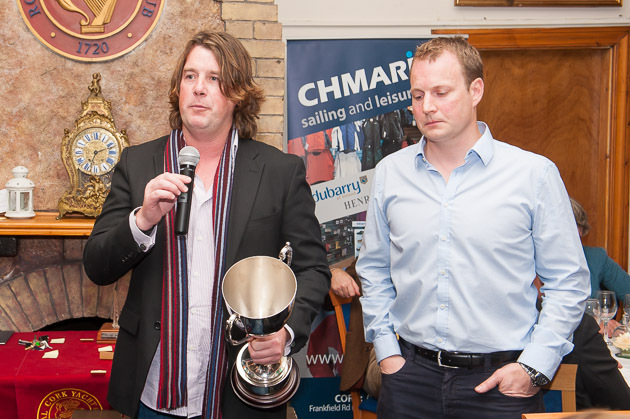 Finally, after dinner, the great moment arrived when it was was time for the Rear Admiral Keelboats, Kieran O’Connell to call on Admiral Pat Lyons and CH Marine Sponsor Nick Bendon to present the prizes. The Sponsor told the assembled gathering how pleased he was to have supported this enormously successful event and he explained he had been telling well known company Crewsaver about the Series and they had agreed to come on board as and furnished top of the range newly introduced lifejackets from their 2014 range for the winners of the top prizes. Splendid prizes indeed. In addition there were perpetual cups and trophies to be handed out. 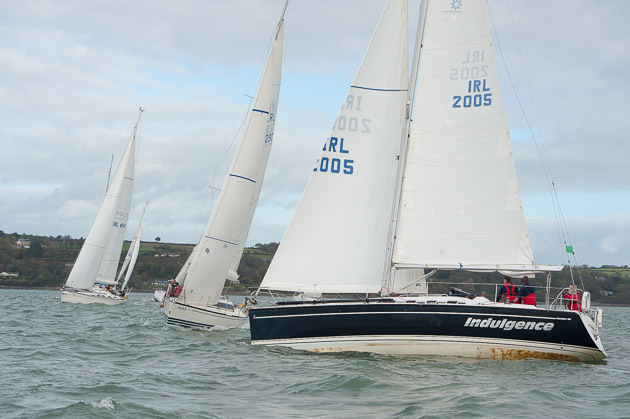 Also singled out for special mention was Alan Mulcahy of Kinsale who has won Class 4 for the past six years in a row and was presented with a photograph of Sundancer to acknowledge this achievement. 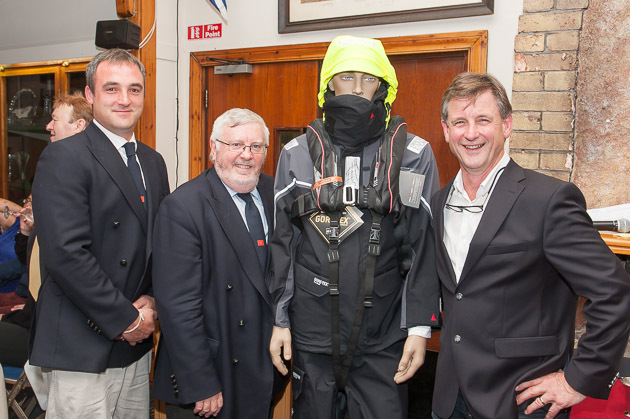 L. to R. Rear Admiral Keelboats Kieran O’Connell, Admiral Pat Lyons, model displaying new Crewsaver Lifejacket and Sponsor Nick Bendon of CH Marine. The Rose family trophy was presented by Marina Rose to Rob McConnell, the overall winner of Class 1 with 9 straight wins and a discard of another straight win. L to R Admiral Pat Lyons, Marina Rose, Rob McConnell and Sponsor Nick Bendon. 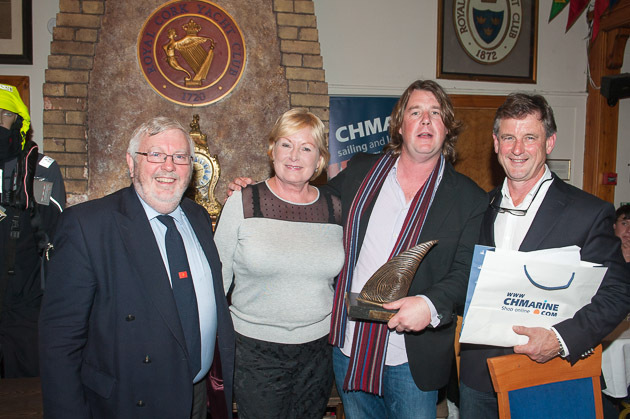 The Gibbons Trophy was presented by Paul Gibbons to Fergus Coughlan winner of Class 2. 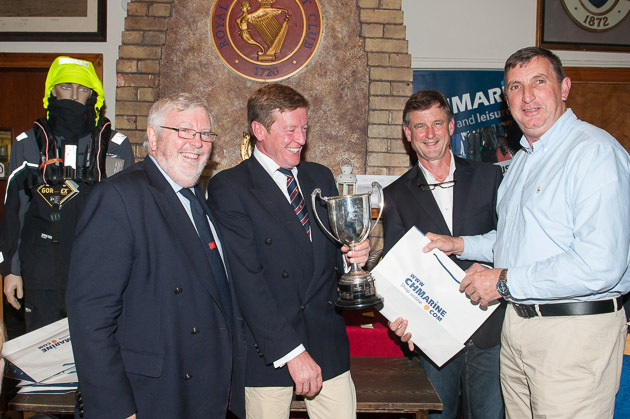 L. to R. Admiral Pat Lyons, Paul Gibbons, Nick Bendon CH Marine and Fergus Coughlan. Rob McConnell receiving the Vinnie O’Shea perpetual trophy from Vinnie O’Shea Junior.This was presented by the O’Shea family in memory of Vinnie who passed away earlier this year.